Microsoft has released new details on the coming Web version of the Windows Phone application Marketplace. The Web edition will launch alongside of the Mango update to the Windows Phone platform. The Web Marketplace will aid in the sharing and dissemination of applications in social channels among friends. The Marketplace will also make use of certain elements of Bing and its Visual Search to help boost the discovery of new applications by users, and thus raise their rate of purchase. 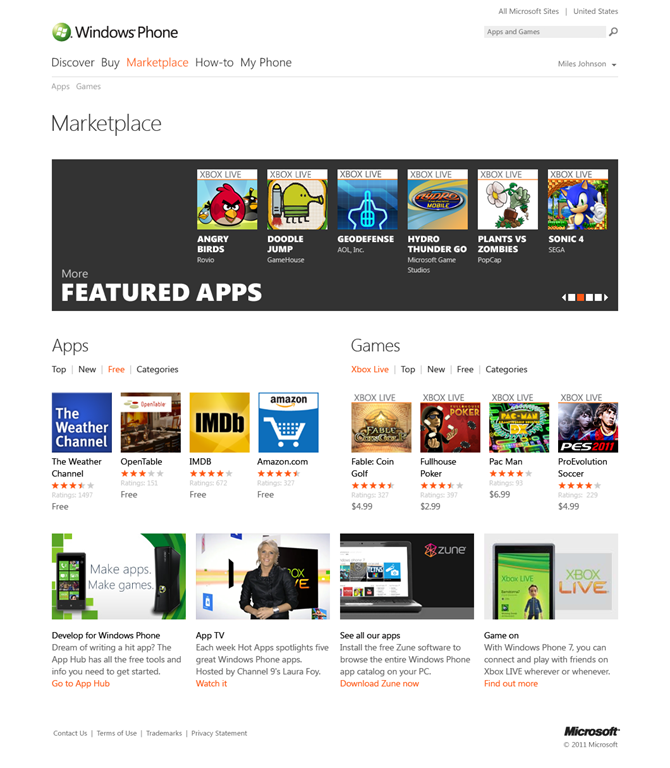 There has been extensive anecdotal reporting that WP7 app sales have been slow; Microsoft is looking to change that. Buying and installing apps from the Web Marketplace is fast and easy, just like the phone experience. Purchases are charged against the credit card already linked to the customer’s existing Windows Live ID. If they prefer, the customer can also opt to assign a new credit card. The apps then download over-the-air to the customer’s Windows Phone via SMS or email. Microsoft will have in place tools to allow for users to keep a running tally of what they have purchased, in case they change phones. Parental controls will also be supported. The company ended the post with its usual slobbery kiss for developers: “By creating more opportunities for customers to get to your great apps, and maybe even discover something they didn’t expect to find, we hope to help you make more money and inspire you to continue creating great apps for Windows Phone.” In other words: please keep writing apps for us, we need you. To catch up on all the recent Mango news, check out our previous coverage.